There is little need to comment on the relationship of this chapter to chapter 15 since both deal with the “seven last plagues” on earth and the condition of things in the “temple . . . in heaven” (Revelation 15:5, 6, 8; 16:1, 17). It all happens while Jesus is coming to earth sitting on the great “white cloud” that He boarded in Revelation 14:14 just after he “cast” the “censer . . . into the earth” in Revelation 8:5. Furthermore, chapters 15 and 16 are the detailed “fleshing out” of the “third woe” depicted in Rev.11:14-19 which is the last of the “seven trumpets” that were given the previous “seven angels which stood before God” in Revelation 8:2. Soon thereafter, “the time of the dead, that they should be judged” (Revelation 11:18) for a thousand years will begin as the saints sit upon “thrones . . . and judgment [will be] given unto them.” They will live and reign “with Christ a thousand years” (Revelation 20:4). 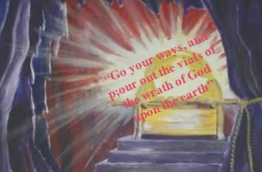 Verse 1: And I heard a great voice out of the temple saying to the seven angels, Go your ways, and pour out the vials of the wrath of God upon the earth. This “great voice out of the temple” must belong to God the Father whose “glory” filled “the temple” (Revelation 15:8) like the “smoke” after His Son left the “temple” and stepped on board the great “white cloud in” Revelation 14:14. 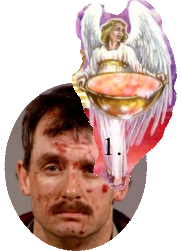 His direct command to the seven angels to empty “the vials” of His “wrath . . . upon the earth” marks the exact time when the 24 elders gave “thanks” to God because He took back to Himself His “great power and hast reigned” (Revelation 11:17) after the “seventh trumpet” was sounded (Rev.11:15). Therefore, the “seven last plagues” comprise God’s active/direct form of punishment in contrast to the previous six trumpet plagues representing God’s indirect, even passive, form of punishment. That began when God gave the “key” to the “star” (Satan) of the “bottomless pit” (Rev.9:1) after Jesus threw down the censer (Rev.8:5). Another example of God “active/direct” form of punishment was when “the Lord rained upon Sodom and upon Gomorrah brimstone and fire from the Lord out of heaven; and he overthrew those cities . . . and all the inhabitants of the cities . . .” (Genesis 19:24, 25). While there are other examples of God’s wrath unmingled with mercy, these “vials of the wrath of God” comprise the last (pre millennial) demonstration of His active/direct form of punishment just before the second coming. Verse 2: And the first went, and poured out his vial upon the earth; and there fell a noisome and grievous sore upon the men which had the mark of the beast, and upon them which worshipped his image. Why would God be so specific? Check out our discussion of Dan.11:30 where the “vile person” had “intelligence with them that forsake the holy covenant.” As we learned there, the “forsakers” are representative of our country that once provided safe harbor for those desiring to escape the “vile person.” It then became instrumental in the final healing of the “deadly wound” (Rev.13:3) that was inflicted upon the “vile person” back in 1798. Consequently, this country will be the recipient of the first manifestation of God’s overt anger. Additionally, this comes just after “the second woe is past; and, behold, the third woe cometh quickly” after “the seventh angel sounded” his trumpet in Revelation 11:14, 15. At this point, when “the second woe is past,” the terrified “remnant” had just survived the “great earthquake” which destroyed “the tenth part of the city” in Revelation 11:13. There, they had been celebrating Wormwood’s great victory over Abaddon. But, the shocking realization that Wormwood was also Abaddon the “destroyer,” shook them far more than the “earthquake” they just survived! In absolute fear and desperation, they “gave glory to the God of heaven” which disgusted Abaddon. But, he, being thoroughly familiar with these prophecies, knew that God had just taken back the “key” that was “given him” (Revelation 9:1) after which the “four winds of the earth” (Revelation 7:1) had been released. Now, he knows he is powerless, nevertheless he resolves to turn the coming events to his own advantage and increase, rather than diminish his power over “them that dwell on the earth” through continued deception. This “noisome and grievous sore” that now falls upon these “men” is in stark contrast to the first trumpet signifying the “hail and fire mingled with blood” that “were cast upon the earth” with “the third part of trees [being] burnt up, and all green grass . . . burnt up” in Revelation 8:7. At that point, the “earth” was “hurt” when Satan was given the power to do so. Now, these “men” who receive the “mark” are hurt, something Abaddon would not be expected to do. His objective was to kill all who “would not worship the image of the beast” (Revelation 13:15) and prosper those who do. But, since he is now powerless, he is forced to make the “best” of the situation. At this point, lets digress for a moment. “Satan . . . is a diligent student of the Bible, and is much better acquainted with the prophecies than many religious teachers. He knows that it is for his interest to keep well informed in the revealed purposes of God, that he may defeat the plans of the Infinite.”  The book of Revelation has probably received his most intense scrutiny and his basic strategy has been to distract and obfuscate. Keep men in ignorance, has been his plan and promote a “general reluctance to investigate its teachings” in order “to conceal from men that which reveals his deceptions. For this reason, Christ the Revelator, foreseeing the warfare that would be waged against the study of the Revelation, pronounced a blessing upon all who should read, hear, and observe the words of the prophecy.” What a blessing it will be to the saints, especially at this point in time because they understand the difference between the trumpets and the plagues! With that thought in mind, we can see how Satan will use the moment between the “second” and the “third” woes to his own advantage. While “the four and twenty elders” who “fell upon their faces and worshipped God” when “the seventh angel sounded” his trumpet knowing full well that now is the time God has “taken to [Himself] His great power, and hast reigned” (Revelation 11:16, 17), the ignorant who considered the study of Revelation of minor importance and were only too willing to accept the traditional understandings, as many and confusing as they might be, will almost certainly believe Abaddon to be the one who caused these “noisome and grievous” sores. The fact that they come “upon . . . men” because they “had the mark” and “worshipped his image” will probably elude them and will come to another conclusion. The saints, on the other hand, will know exactly that “the God of heaven” has just begun to manifest His displeasure against those who “had the mark of the beast, and upon them which worshipped his image.” If they had not been saying it before during the previous trumpet scenarios, they will surely be saying it now “with a loud voice to him that sat on the cloud, Thrust in thy sickle, and reap: for the time is come for thee to reap; for the harvest of the earth is ripe” (Revelation 14:15). Verse 3: And the second angel poured out his vial upon the sea; and it became as the blood of a dead man: and every living soul died in the sea. While some believe the second trumpet and the second plague are the same, there is ample reason to believe they represent completely different events. We have already concluded that the “second trumpet” scenario depicts something that Satan is responsible for, while the the second plague (as well as the first) is a calamity that God Himself is responsible for. Consequently, it would be inconsistent to consider them identical. 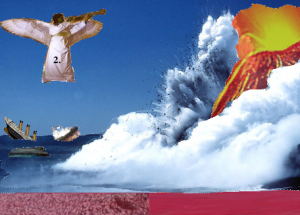 Compare this scenario with “the second angel” who “sounded” his trumpet followed by “a great mountain” being “cast into the sea: and the third part of the sea became blood; and the third part of the creatures which were in the sea, and had life, died; and the third part of the ships were destroyed.” in Revelation 8:8,9. 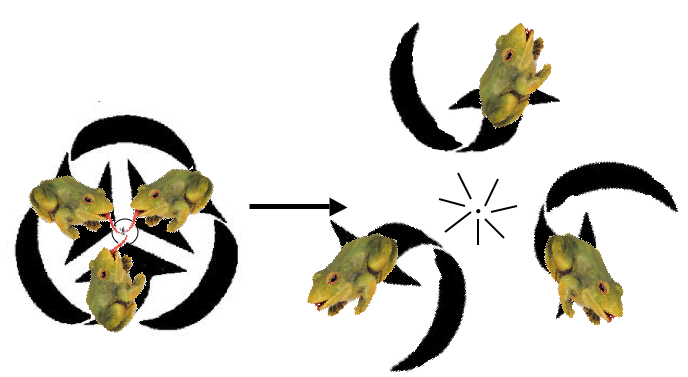 So, there are some similarities between the second trumpet and second plague. But, before considering these similarities, keep in mind the complete dissimilarity between the first trumpet and plague. That fact should give us pause before concluding that the similarities seen here mean that the second trump and second plague are the same. But, from the perspective of the wicked, this event will seem to them an even more ominous demonstration of Abaddon’s power to punish those who “gave glory to the God of heaven” (see Rev.11:13). But, there is more behind Abaddon’s purpose. He, knowing he will have to deal with this event whether he likes it or not, plans to use it to goad his followers into annihilating the nonconformists who refuse to worship the beast, his image or to receive his mark. True, they have already been severely persecuted, ridiculed and ostracized from society, and even martyred prior to the trumpet scenarios, but that fails to satisfy his lust. He wants to annihilate them all. Even though the saints are hated, it seems there is some reluctance even on the part of the wicked to legislate a massacre of global proportion. 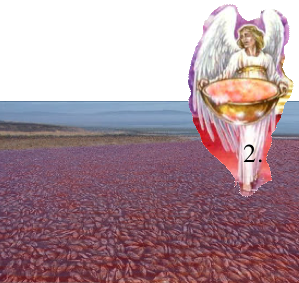 Verse 4: And the third angel poured out his vial upon the rivers and fountains of waters; and they became blood. All the “sea” becoming a bloody mass, was bad enough. But when “the rivers” and springs become polluted, things become desperate. Therefore, this plague cannot be ignored. Even though “These plagues are not universal, or the inhabitants of the earth would be wholly cut off” “Yet they will be the most awful scourges that have ever been known to mortals.” Therefore, we should consider them literal making water unusable for drinking and even for irrigating crops. The saints, like the 144,000 will “have seen the earth wasted with famine and pestilence, the sun having power to scorch men with great heat, and they themselves have endured suffering, hunger, and thirst” as noted in Revelation 7:14-16. Part of that “suffering,” inclusive of “hunger and thirst” must have been experienced during this plague. 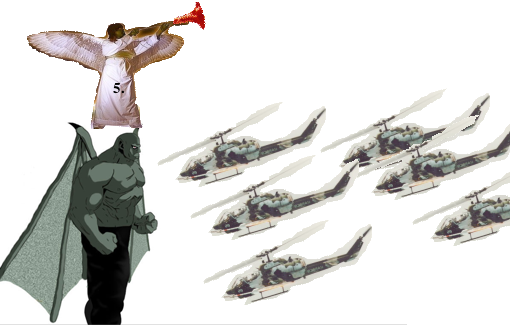 Compare this scenario with the events associated with the third trumpet. When “the third angel sounded” his trumpet “there fell a great star from heaven” whose “name . 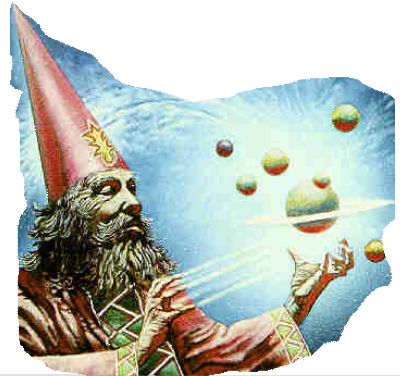 . . is called Wormwood.” That “star,” represents a celestial being who caused “the third part of the rivers, and . . . the fountains of waters” to become “bitter” instead of bloody. There is no other parallel in the third plague, and we must conclude it to be a good deal different than the third trumpet. From the perspective of the wicked, seeing the sea turned to “blood,” then the same thing happening to the “rivers” and the springs, and recalling how “many men died of the waters, because they were made bitter” by “Wormwood” (who is now Abaddon) the “great star” that “fell from heaven” (Revelation 8:10, 11), leads them to conclude that they really have no choice then to obey his demands. So, things are really looking bad, not only for the world, but for the righteous as well. Going back to the celebration scenario of Rev.11:8-12, Mrs White, in this quote, puts herself and the righteous in the first-person sense: The wicked “charged us with taking an independent position from all the rest of the world. They had cut off our resources so that we could not buy or sell, and referred to our abject poverty and stricken condition. They could not see how we could live without the world; we were dependent upon the world, and we must concede to the customs, practices, and laws of the world, or go out of it (in other words, be killed). If we were the only people in the world whom the Lord favored, the appearances were awfully against us. They declared that they had the truth, that miracles were among them, that angels from heaven (like Wormwood?) talked with them and walked with them, that great power and signs and wonders were performed among them, and this was the temporal millennium that they had been expecting so long. The whole world was converted and in harmony with the Sunday law, and this little feeble people stood out in defiance of the laws of the land and the law of God, and claimed to be the only ones right on the earth.” But, when the plagues are being poured out bringing misery and despair instead of the millennial peace and prosperity they were anticipating, the wicked will be more resolved then ever to make the righteous “go out of” the world! Verse 5: And I heard the angel of the waters say, Thou art righteous, O Lord, which art, and wast, and shalt be, because thou hast judged thus. This “angel of the waters” is the same “third angel” of verse 4 who just “poured out his vial upon the rivers and fountains of waters.” That third plague deprived the wicked of their potable water supply. So here this angel springs to the defense of God for ordering such a dreadful thing. Therefore, even for angels, it is an awful sight to see men and women dying in this manner. Now, some two thousand years later having watched “Satan’s power,” even after Christ’s crucifixion, growing far beyond what even the angels could have imagined, now topped off by the dreadful massacre of God’s people when the “fifth seal” (Rev.6:9-11) was opened followed by the dreadful destruction and mayhem cause by Satan’s agents during the first six trumpet episodes, the heavenly angels are fully in agreement that the time for God to exterminate rebellion is well past due. Further delay would only result in more suffering, more bloodshed, more misery. Note the lack of a corresponding expression of approval from any other angel during the trumpet scenario. 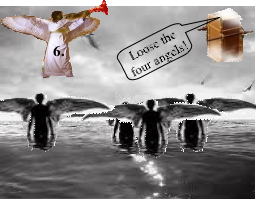 The first six trumpet angels simply sound the alarm, and then the destructive and devious actions of Satan began. The question naturally arises, why is it necessary for God to pour out this additional misery upon the rebellious in the form of the “seven last plagues?” It would seem Satan’s devious manipulations of his followers would be punishment enough! The next two verses serve to answer that question. Verse 6: For they have shed the blood of saints and prophets, and thou hast given them blood to drink; for they are worthy. The pronoun “they” refers to “the men which had the mark of the [sea] beast, and . . . them which worshipped his image” in verse 2. Therefore “they” represent the wicked who were guilty of murdering the “souls of them that were beheaded for the witness of Jesus, and for the word of God . . . which had not worshipped the beast, neither his image, neither had received his mark upon their foreheads, or in their hands.” (Rev.20:4) By now, we understand that those “souls” are the “fellowservants and their brethren” who were prophesied to “be killed as” were the martyrs of history when the “fifth seal” of Rev.6:9-11 was opened. We also understand that to be indicative of the time when the Investigative Judgment of the dead passed to the living. Therefore, even if the Jews in Christ’s day and all the “holy men which” who were martyred “since the days of Abel” had never seen the “sea beast” or its “image,” much less his “mark,” the same guilt rests upon those who yield to this modern day abomination that came upon those in past ages who slew the “saints and prophets” for refusing to bow to the abominations of the past. Be-that-as-it-may, those suffering the effects of the seven last plagues, were not guilty of what their forefathers had done, but which they had done after the judgment had passed from the dead to the living. It was the living wicked who will be guilty of an enormous massacre carried out against God’s people during the probationary time of the “fifth seal” just prior to the time of the trumpets which begin when the seventh seal (Rev.8:1) is opened. Now, as the “third” plague bearing angel declares, God is calling them to account for their wickedness. Going back to Daniel 11, these last day “saints and prophets” must be “they that understand among the people” and the “many” people “they shall instruct” (Daniel 11:33) are called “the great multitude” of Revelation 7:9,10. Even though it is promised that they will “come out of (or survive)” the “great tribulation” (Rev.7:14), they will yet have faced the threat of “sword . . .flame . . .captivity, and . . .spoil, many days.” (Dan.11:33) But, “when they shall fall, they shall be holpen with a little help . . . to try them, and to purge, and to make them white, even to the time of the end:” (Daniel 11:33-35). Verse 7: And I heard another out of the altar say, Even so, Lord God Almighty, true and righteous are thy judgments. At this point “angels” have been depicted four times in verses 2, 3, 4 and 5 and it is natural to assume that “another” angel is being referred to here. But, check back on Revelation 14:18 where “another angel [also] came out of the altar” who had “power over fire” but has no “sickle.” Nevertheless He commands the sickle bearing angel to “Thrust in [his] sickle” suggesting He is the same “angel” who came and “stood at the altar” in Revelation 8:3, which is our Lord and Saviour called “”one . . . like unto the Son of man” in Revelation 14:14. Even though that other “angel” in Revelation 14:18 has no sickle, in effect He actually does have a sickle by virtue of His authority to command the sickle bearing angel to use his. But, is this person called “another out of the altar” Jesus Christ? Probably not because this person praises Him as “Lord God Almighty” and Jesus is never calls out praises to Himself. Besides, He will have left the “altar” in heaven when He stepped onto the great “white cloud” in Rev14:14. In spite of experiencing, hunger, thirst, heat and the taunts and mocking from the wicked, they have nothing but praise for the “true and righteous . 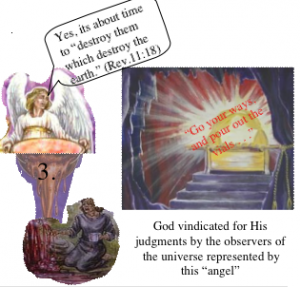 . . judgments” of God. They will have taxed the mind to understand clearly define the book of Revelation . Now, they know without question the meaning of the things taking place in the world around them at this crucial stage in world history. 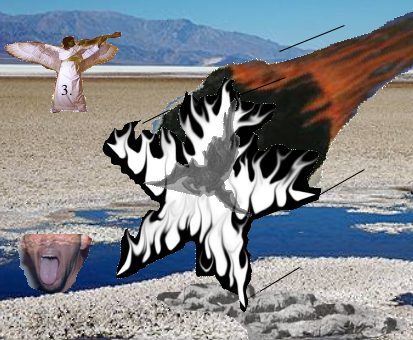 Verse 8: And the fourth angel poured out his vial upon the sun; and power was given unto him to scorch men with fire. This verse takes up where “the third angel” of verse 4 left off. His vial contaminated “the rivers and fountains of waters” with “blood.” This one intensifies the sun’s radiation to such an extent “men” are scorched. This adds to the agony of those, suffering under the effects of the third plague, and who are desperately searching for fresh water to quench their thirst and water their crops. Compare this with “the fourth angel [who] sounded” his trumpet. There “the sun was smitten” instead of intensified, evidently causing “the third part of the moon . . . stars . . . day . . . and the night” (Revelation 8:12) to be “darkened,” clear evidence that the fourth trumpet and the fourth plague are not the same except that both take place during post probationary time. So, what point does God have in strengthening the sun? Evidently, He is protesting the sun worship featured in the religion of the wicked, who like the apostates of ancient time turned “their backs toward the temple of the LORD, and their faces toward the east; and they worshipped the sun toward the east” (Ezekiel 8:16). Here, God who can move the sun backwards or forward (see 2 Kings 20:9, 10, 11; Isa.38:8) with ease and even cause it to stand still (Joshua 10:12), can also intensify it. But, it appears to the wicked that Abaddon, who somehow succeeded in diminishing the sun in the fourth trumpet scenario, is now able to convince them that he can also intensify it. Even though the “two witness” who were given unusual power of the Holy Spirit during the “loud cry” scenario of Revelation 11:3-6 and had “power to shut heaven, that it rain not in the days of their prophecy: and [had] power over waters to turn them to blood, and to smite the earth with all plagues, as often as they” wished, their “testimony” was rejected just before “they shall have finished their testimony . . .” (Revelation 11:7). So, there was no excuse for the wicked at this point in time. Sadly, they could have understood and made peace with God when they had the opportunity. Now, it is too late. So, who are these “men” who “were scorched” and gave vent to their feelings by blaspheming “the name of God?” They must be “the men which had the mark of the beast, and . . . worshipped his image” (verse 2). They were already blaspheming the name of God by attributing to man the prerogatives of God. But, not long before when Abaddon, who was masquerading as Wormwood, caused “a great earthquake” that slew “seven thousand” men, “the remnant were affrighted, and gave glory to the God of heaven” (Revelation 11:13). Evidently, these same “men” who are now being “scorched with great heat . . . blasphemed the name of God” by attributing this inferno to Abaddon instead of “the God of heaven,” while at the same time uttering imprecations and oaths. But, another class of men, those who will at last be “arrayed in white robes” and who will have come “out of [this] great tribulation” when “the sun light[ed] on them” (Revelation 7:16) and felt this same “great heat,” will yet give “glory to the God of heaven” in spite of their discomfort. 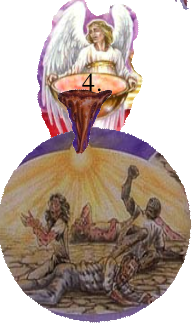 They will have no doubt that this was God’s plague number four with only three remaining. Even though the “people of God will not be free from suffering” and “while they endure privation, and suffer for want of food, . . . the God of Israel will not forsake them’” because they will not forsake Him. Seemingly, such desolation would bring extinction to the human race. However, “these plagues are not universal, or the inhabitants of the earth would be wholly cut off. Yet they will be the most awful scourges that have ever been known to mortals.” All, whither afflicted directly or hearing about them indirectly from other quarters, will be fully aware of them. At this point in time, the “seat of the beast” must be located “where also our Lord was crucified,” the same “city” where there was “a great earthquake” that destroyed a “tenth part” of the city and killed “seven thousand” “men” at the end of the “second woe” or sixth trumpet scenario (Revelation 11:8, 13, 14). That was when it was learned that Wormwood, the false christ, was actually Abaddon, the destroyer. This is the place where evil men were laying plans to carry out the universal death decree to exterminate all who worshiped the true God and were resisting Abaddon’s rule. Little wonder that this plague was poured out specifically upon “the tabernacles” of the vile person’s “palace between the seas in the glorious holy mountain” (see Daniel 11:45). The Commentary suggests this “is literal darkness” bringing with it “its attendant cold and misery” because of “the absence of light and heat.” That “would be all the more impressive and painful after the intense heat experienced under the fourth plague.”  So, again, the wicked are even more convinced that Abaddon, who diminished the sun in the fourth trumpet scenario (Revelation 8:12), has now diminished it again just after intensifying just previously in the fourth plague. 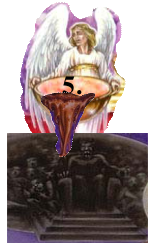 Compare this “fifth” plague bearing “angel” with the “fifth” trumpet bearing “angel” of Revelation 9:1-11 where John “saw a star fall from heaven unto the earth, . . . the angel of the bottomless pit, whose name in the Hebrew tongue is Abaddon, but in the Greek tongue hath his name Apollyon.” He was the commander of the strange, locusts-horse-scorpion-like creatures who had the ability to torment “men” which [had] not the seal of God in their foreheads” for “five months.” Their sufferings were so sever that they “desire[d] to die” but “death” fled “from them.” Their suffering is similar to the anguish suffered in this plague although there is no mention of a wish to die. As anybody knows how painful it is to accidentally bite the tongue, actually gnawing it to counter the pain of this plague, will indeed, be awful! But, in spite of the similarities, this plague is not the same as the fifth trumpet, primarily because of the sequence involved and the fact that this scenario is a manifestation of God’s wrath after He began to “reign” and had “taken to [Himself His] great power” (Revelation 11:17). On the other hand, the scenario of the fifth trumpet was one of the manifestations of Satan’s wrath when he used the army of his pale horse followers to goad those of the red horse into retaliating. So, while the “pains” came from the “fifth” angel’s “vial,” “their sores” must have come from “the effects of the first plague” of verse 2 suggesting those located at the “seat of the beast,” at least, suffered from two of the plagues even though they are not universal. Note the attitude of the sufferers who “repented not of their deeds” like “that woman Jezebel” who “repented not” of “her fornication”(Revelation 2:21) and “the rest of the men which were not killed by” the smoke, fire and brimstone of the sixth trumpet (Revelation 9:18) who “neither repented . . . of their murders . . . sorceries . . . fornication” or “thefts”(Revelation 9:21). This is more evidence that the “remnant” who survived the “great earthquake” and who “were affrighted” or terrified into giving “glory to the God of heaven” (Rev.11:13), were not really sincere. Furthermore, the “synagogue of Satan” who once claimed to be “Jews” (Revelation 2:9; 3:9), the philosophy of the people represented by the “red horse” (Revelation 6:4) have now abandoned that claim and are fully committed to the worship of Satan, the religion of the people represented by the “pale horse” (Revelation 6:8). And, as before, they continue to blasphemously recognize Abaddon as “the God of heaven.” To him they direct their complaints. Verse 12: And the sixth angel poured out his vial upon the great river Euphrates; and the water thereof was dried up, that the way of the kings of the east might be prepared. According to one view suggested in the Commentary: “the drying up of the waters of the Euphrates refers to the withdrawal of human support from mystical Babylon in connection with the sixth plague.” That makes good sense. Additionally, the context places us at the point where the universal death decree has been planned and is now about to be executed. Therefore, “the great river Euphrates” must represent, not only the “throngs of evil men” who “are about to rush upon their prey,” but all the wicked who approve of the awful decree and even the rulers of the land who legislated the “decree” including the “hour” of its execution. By the time the sixth of the seven plagues is poured out, there will be no neutral ground between the “great river” and the “kings of the east.” All will find themselves on the side of Abaddon or on the side of “the God of heaven.” All will either endorse the universal death decree while others will be victimized by it. The reason for such a remarkable polarization of earth’s population is because the “kings of the east,” who were given the tremendous power of the Holy Spirit, were so successful in bringing the “tidings out of the east and out of the north” (Daniel 11:44) that “the knowledge of the Lord” covered the earth “as the waters cover the sea.” (Habakkuk 2:14) All, without exception, were given sufficient knowledge upon which to base an intelligent decision. The force of circumstances, such as the economic boycott that preceded the trumpet scenario, were such that all were compelled to make up their minds even before Jesus cast the “censer” “into the earth” (Revelation 8:5). 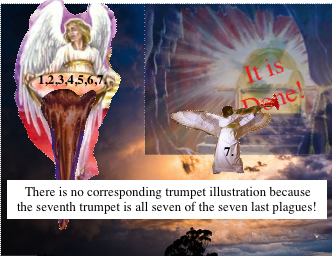 The trumpet scenario, with the last being inclusive of all seven of the seven last plagues, served to demonstrate to the on-looking universe the real character and behavior of those who decided to accept the message of the eastern “kings,” and those who decided to reject it. None will be able to plead ignorance. 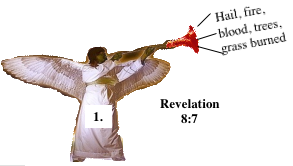 Compare this “sixth” plague bearing “angel” with the “sixth” trumpet bearing “angel” whose trumpet blast warned that “the four angels” who were “bound in the great river Euphrates” were now “loosed” in order “to slay the third part of men” (Revelation 9:14). At that point, the “great river,” representing the human forces that support and protect mystical Babylon, was running strong. Now, with the pouring out of the “sixth . 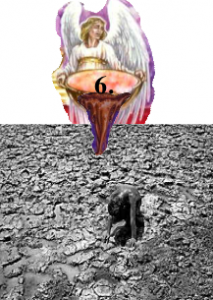 . . vial,” it is “dried up” which is radically different from the sixth trumpet scenario. 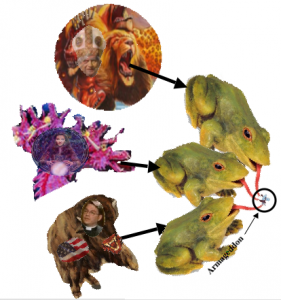 Verse 13: And I saw three unclean spirits like frogs come out of the mouth of the dragon, and out of the mouth of the beast, and out of the mouth of the false prophet. Here, John digresses from the order of the plague events before concluding with the final seventh “vial” in verse 17. Here and in the next three verses, he looks back retrospectively at some things that took place during probationary time which culminated in the post probationary trumpet scenario after the seventh seal was opened and Jesus threw down the censer (Rev.8:1-5). Jesus encountered “unclean spirits” several times during His earthly ministry. He, having far more power than they, always “cast them out” of whoever they were tormenting. He also shared His power with His followers enabling them to do the same thing. (see Matthew 10:1; Mark 1:27; 3:11; 5:13; 6:7; Luke 4:36; 6:18; Acts 5:16; 8:7) On one occasion those “spirits claimed to be “Legion: for we are many” (Mark 5:9) they claimed. Here, only “three” are depicted and likened to “frogs” “probably . . . to highlight the repulsiveness” of these “spirits.” Each of them hopped “out” of the mouths “of the dragon . . . beast” and “false prophet.” Frogs possessing the unique ability to capture their prey with a specialized tongue that can extend out with lightning speed and remarkable distance, here represent the remarkable success these last day agents of Satan have had in capturing their human prey. First-of-all, the “dragon . . . that old serpent, called the Devil, and Satan” (Revelation 12:9), gave the “beast . . . his power, and his seat and great authority” (Revelation 13:2) over the world which it retained for 1260 years. But, when “another beast” that “had two horns like a lamb” (Revelation 13:11) representing the separation of church and state came “up out of the earth” sometime in 1776. Then, the world witnessed true freedom being exercised without the ecclesiastical control of the pope. Consequently, in 1798, “one of [the sea beast’s] heads” was “wounded to death” when the pope was taken prisoner by the French. The “dragon” was not happy with that development and he influenced the earth beast to “speak like” himself and repudiate the principle of the separation of church and state. This was accomplished by dazzling the world with “great wonders,” even making “fire come down from heaven on the earth in the sight of men” deceiving them with “miracles” because the “dragon” gave him that “power.” Along with those wonders he “had power to give life unto” an “image of the [sea] beast” (Revelation 13:15) causing it to “speak” the same “great things” it used to say during the previous “forty and two months” (Revelation 13:5) of the dark age of history. Thus, the earth beast gained the dubious distinction of becoming the “false prophet” who enabled the sea beast’s “deadly wound” to heal by instituting the “image” and “mark” (Revelation 13:15-17). Looking deeper, these “spirits” represent a confederation called the “three fold union” of “spiritualism, Catholicism” and “apostate Protestantism.” Primary, among the “great things” they espouse are “the immortality of the soul, and Sunday sacredness . . .” Under the influence of those “great things,” “Satan will bring the people under his deceptions. While the former lays the foundation of Spiritualism, the latter creates a bond of sympathy with Rome. The Protestants [the ‘false prophet’ the forsakers of the “holy covenant” (Dan.11:30)] of the United States will be foremost in stretching their hands across the gulf to grasp the hand of Spiritualism; they will reach over the abyss to clasp hands with the Roman power; and under the influence of this threefold union, this country will follow in the steps of Rome in trampling on the rights of conscience.” Therefore, the “immortality of the soul” and “Sunday sacredness” are examples of what could be likened to the remarkable “tongue” of these “spirits” enabling them to capture their prey, which are the souls of men. Prior to 538 A.D., the field of battle was only divided between two parties: true Christianity and the overt Paganism characterized by pagan Rome. Therefore, during the period, between 31 and 538 A.D., only the “frog out of the mouth of the dragon” could be said to exist (in the metaphoric sense). It could be said that the “frog out of the mouth of the beast” came into existence and dominated the religious and political scene from 538 to 1798 A.D.
Verse 14: For they are the spirits of devils, working miracles, which go forth unto the kings of the earth and of the whole world, to gather them to the battle of that great day of God Almighty. While most of us are aware of Satan’s “crowning act in the great drama of deception” in which “Satan himself will personate Christ,” few, if any have considered “Wormwood” to be the Biblical version of that delusion. Fewer still consider “Abaddon” or “Apollyon,” to be an extension of that final delusion. But, because of preconceived ideas of what those names represent rather than allowing the Bible to explain itself, coupled with fear of anything different, we have missed a very important insight into what the future holds for God’s people. The term “day of God Almighty,” is synonymous with “day of the LORD” found some 26 times in the Bible. Generally speaking, it is a time of reckoning, when the Lord calls men to account for their wickedness. For example, it is a time when “every one that is proud . . . shall be brought low (Isaiah 2:12); a time that is “cruel” (Isaiah 13:9), a time “of the Lord’s vengeance” (Isaiah 34:8), His “anger” (Lamentations 2:22), it is “very terrible” (Joel 2:11), a day of “darkness” (Amos 5:20), “wrath” (Zephaniah 1:18), etc. The essence of the phrase “day of God Almighty” could be thought to harmonize with the figurative “bottomless pit” (Revelation 9:1, 2, 11; 11:7; 17:8; 20:1, 3.) of post probationary time. That metaphor is descriptive of the spiritual situation of the whole world after Jesus casts “the censer into the earth” (Revelation 8:5)! After that, the “seven angels which stood before God” that were “given seven trumpets” will begin to sound them one-by-one (see Revelation 8:2, 6) with the last trumpet culminating in the seven last plagues. 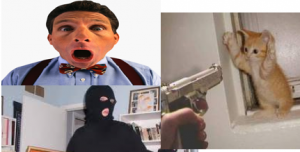 Verse 15: Behold, I come as a thief. Blessed is he that watcheth, and keepeth his garments, lest he walk naked, and they see his shame. This is the same warning given “the church in Sardis” who had “a name that thou livest, and art dead.” Jesus said “If therefore thou shalt not watch, I will come on thee as a thief, and thou shalt not know what hour I will come upon thee” (Revelation 3:3) implying they could know the “hour” if they were watching. Therefore, the “thief” analogy is a warning to those who fail to realize the nearness of His coming. Right at the beginning of John’s vision which came to him some 2,000 years ago, some of the first words were: “the time is at hand” (Revelation 1:3) and “Behold I come quickly” (Revelation 3:11). Some mock saying “how could such an ancient warning be quick?” not realizing that time stops at death for each and every individual. After that the judgment will come and all will find themselves lofted into heaven at the time of the “first resurrection”(Revelation 20:5,6)  or standing outside “new Jerusalem” at the time of “the second death” (Revelation 2:11; 20:6, 14; 21:8). From that perspective, Christ’s coming will indeed be quicker then we can possibly imagine! So, instead of confusion, “Blessed is he that readeth, and they that hear the words of this prophecy, and keep those things which are written therein: for the time is at hand” (Revelation 1:3). “To John were opened scenes of deep and thrilling interest in the experience of the church. . . . Subjects of vast importance were revealed to him, especially for the last church, that those who should turn from error to truth might be instructed concerning the perils and conflicts before them. None need be in darkness in regard to what is coming upon the earth.” And it is vital for us as well as for those around us to share these things as much as possible. Verse 16: And he gathered them together into a place called in the Hebrew tongue Armageddon. Who is “he?” If we accept the personal pronoun “he” as written, it would direct us to the sixth angel of verse 12 whose plague serves to dry up and disperse rather than gather. The comment in the Commentary is helpful here. It suggests that “the Greek may be translated either way” as “he” or “they.” It further declares that “The context favors the translation ‘they.’ For the gathering process see on v.14.”  There, we see the “three unclean spirits” of “Spiritualism, Catholicism and apostate Protestantism,” the instruments in the hand of Satan used to gather together the disparate nations of the “whole world” (v.14) into the “threefold union.” It is only until the sixth angel pours out his plague that this union will fall apart. So, this “threefold union” brings “the whole world (see verse 14) . . . together into a place called . . . Armageddon.” If it were a literal “place,” namely “in the literal valley of Megiddo, in northern Palestine” on “that great day of God Almighty,” it is inconceivable that that “place” has room for all six billion of earth’s inhabitants much less keep them there while fighting for any period of time! Statement (2) is not quite so clear. While it connects the “battle of Armageddon” with the postprobationary scenario of the “seventh vial,” it also associates it with the “loud cry” scenario of Rev.18 that will cause a tremendous reaction in the religious world during probationary time! Statement (3) first depicts the loud cry scenario of Rev.18, then implies that the “battle of Armageddon” will take place subsequent to that when “all the world will be on one side or the other of the question” lodged by the loud cry. Evidently, during postprobationary time. Statement (4) is almost definitive! It clearly associates the “battle of Armageddon” with all the trumpets and the vials! In summary, neither the Bible nor the Spirit of Prophecy connect the “battle of Armageddon” with a single battle or a single geographic location on the earth. Instead, it appears very likely, that the “battle of Armageddon” covers the world-wide, post probationary period of time portrayed by the “seven trumpets” of Revelation. Verse 17: And the seventh angel poured out his vial into the air; and there came a great voice out of the temple of heaven, from the throne, saying, It is done. This verse brings to an end the parenthetical, retrospective scenario of the three miracle working spirits of verses 13 to 16, and reconnects us with the last of the “seven last plagues,” that ended with the sixth plague in verse 12. The “vial” of the “sixth angel” brought the onrushing hoard of the wicked represented by “the great river Euphrates” who were bent on annihilating the people of God, to a dead stop. But, God isn’t finished. He commands the pouring out of just one more “vial,” the seventh. Five verses (17-21) are required to cover that plague. While the previous six were poured out on “the earth, the sea, the rivers and fountains, the sun, the seat of the beast” and finally, “the great river Euphrates,” this is poured out “into the air” or “upon the air” suggesting it has something to do with the atmosphere. The Commentary suggests: “The effect of this plague appears to be universal” which seems reasonable because no plague is to follow. The earth is to receive its final blow. Very likely, during the interval between the sixth and seventh vials when “the great river Euphrates”[is] dried up,” the “synagogue of Satan, which say they are Jews, and are not, but do lie . . . will . . . come and worship before [the] feet” (Revelation 3:9) of the saints, finally recognizing that God had loved them all along. But, sadly, their repentance brings no more benefit to them than the people represented by the red horse who “were affrighted, and gave glory to the God of heaven” (Revelation 11:13). The events of the “third woe” (Revelation 11:14) that followed their acknowledgment, proved it hollow. Now, the “great voice out of the temple of heaven,” must be from God the Father whose “glory” “filled” the “temple” like “smoke” preventing the entrance (by faith) of any man while “the seven plagues of the seven angels” (Revelation 15:8) were being poured out. According to our understanding of Rev.14:15, the other “angel” who “came out of the temple” represents the saints on earth who followed Jesus by faith as He took His place on the great “white cloud” (verse 14). Therefore, from the time Jesus “came and stood at the altar” in the heavenly temple and “took the censer, and filled it with fire of the altar, and cast it into the earth,” (Rev.8:3,5) signaling the sounding of the seven trumpets, the saints knew exactly what was transpiring. They knew that Jesus had left the temple and was now on His way earthward. He was no longer in the temple in heaven. 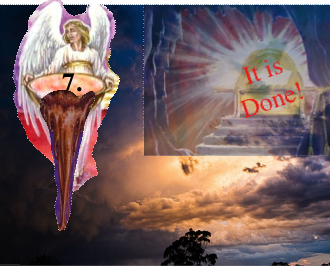 Now, at the beginning of the seventh plague, the decisive words “It is done” are uttered by God the Father “out of the temple in heaven.” As we noted in Rev.10:7 that “in the days of the voice of the seventh angel, when he shall begin to sound, the mystery of God should be finished . . .” Knowing that this “seventh angel” is inclusive of all seven of the seven last plagues, we can see that the “mystery” of who the true God really is, took a number of plagues to erase the mystery. In fact, the “mystery” was not completely erased even after the sixth angel (verse 12) caused the drying up of the “great river Euphrates.” Note again that the eradication of the mystery takes place sometime during “the days of the voice of the seventh angel,” not immediately. Verse 18: And there were voices, and thunders, and lightnings; and there was a great earthquake, such as was not since men were upon the earth, so mighty an earthquake, and so great. Verse 19: And the great city was divided into three parts, and the cities of the nations fell: and great Babylon came in remembrance before God, to give unto her the cup of the wine of the fierceness of his wrath. Why such carnage? It is because “the mystery of God,” referred to by the “mighty angel” John “saw stand upon the sea and upon the earth [who] lifted up his hand to heaven, and sware by him that liveth for ever and ever . . . that there should be time no longer” is finished. So, in the days of the voice of the seventh angel [or ‘third woe’], when he shall begin to sound, the mystery of God should be finished . . .” (Revelation 10:7). Now it is abundantly clear to the wicked that they have been completely duped by Wormwood and Abaddon and, to their horror, find themselves hopelessly cast into the “bottomless pit” (Revelation 9:1,2, 11; 11:7; 17:8 and 20:1,3). Verse 20: And every island fled away, and the mountains were not found. Perhaps the flooding of the “seaports” and the disappearing “islands” might be due to the melting of the snow and ice in Greenland and the Antarctic because of the increased power of the sun during the fourth plague when “men were scorched with great heat.” If so, “global warming” will have become an awesome reality. Far better to risk the wrath of man who enforce compliance with their evil schemes than to risk the wrath of God whose “strange act” (Isaiah 28:21) depicted in these plagues “will not always . . . keep his anger forever” (Psalms 103:9). Verse 21: And there fell upon men a great hail out of heaven, every stone about the weight of a talent: and men blasphemed God because of the plague of the hail; for the plague thereof was exceeding great. Comparing this with the first trumpet of Rev.8:7, we also find “hail” there. But it is “mingled with blood” as well as “fire.” In contrast, no “blood” or “fire” is depicted anywhere in the seventh plague scenario of verses 17 to 21. Instead, this verse focuses on “a great hail out of heaven,” clearly the same “great hail” depicted in Rev.11:19. Like the “hail” of this verse, it too was accompanied by “lightnings, and voices, and thunderings, and an earthquake” that we see here in verses 17-21 of this chapter. With each “stone” weighing somewhere between 100 and 200 pounds, all life, it would seem, would be totally extinguished. Nevertheless, because these plagues are not universal, many survive to see Jesus come “with clouds; and every eye shall see him” (Revelation 1:7). This must be the final event depicted in the scenario of the “third woe” of Revelation 11:14. 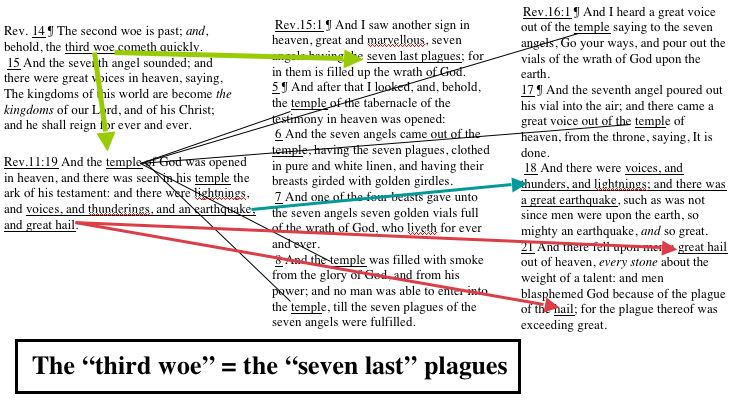 Therefore, the “third woe” must be inclusive of all seven of the seven last plagues even though it appears to focus only on the events of the seventh plague bearing angel. It also (Rev.11:14-21) depicts the “four and twenty elders” expressing feelings of joy and relief “because” God has retaken to Himself His “great power” that was previously relinquished to Satan during the first six trumpet episodes. The view then looks down to earth (verse 18) to depict the anger of earthly “nations” because God’s “wrath is come,” a change that was completely unexpected. It was unexpected because the “nations” were looking forward to a thousand years of peace and prosperity. Instead, these devastating plagues indicate calamity instead of prosperity. Thinking themselves to be punished by Abaddon (or Appolyon), they, under the influence of Satan, make God’s people the scape-goat and determine to eradicate them from the face of the earth. Summary of Chapter 16: This chapter itemizes the “seven last plagues” scenario referred to in chapter 15:1, 5-8. While Revelation 15:2-4 depicts the reward of the righteous who overcame “the beast, image, mark” and “number” paradigm which is the “test that the people of God must have before they are sealed” and further illustrated by the metaphoric frogs in Revelation 16:13-16, this chapter is devoted entirely to a portrayal of the reward of the wicked “which had the mark of the beast” and “worshipped his image” (Revelation 16:1) during the last phase of the post probationary, pre millennial executive judgment paradigm of the seven trumpets. 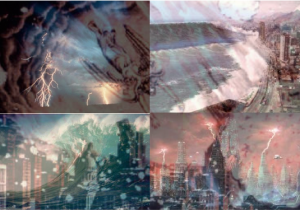 Attention is called to the parallels existing between Revelation 11: 19 and 15:1, 5-8 and 16:1-12, 17-21 reminding us that the “third woe” or “seventh” trumpet (Revelation 11:14, 15) that comes “quickly” after the “second woe is past,” is all seven of “the seven last plagues”  depicted in this chapter with both ending with “lightnings, and voices, and thunderings and an earthquake, and great hail” (Revelation 11:19) and “voices, and thunders, and lightnings . . . a great earthquake” and “a great hail” (Revelation 16:18, 21). Attention is also called to the fact that this “seventh angel” “third woe” scenario is the time when “the mystery of God [will] be finished” “in the days of the voice of the seventh angel” (Revelation 10:7). Furthermore, since there is striking dissimilarity between first trumpet and first plague, making them totally different, it stands to reason all the rest of the trumpets and plagues are also different in spite of the similarities that exist between some of them. It is unlikely Satan, as Abaddon, will identify the disenters as “God’s chosen people,” rather as troublmakers and irreconsilable nonconformists with the “new world order” who must be irradicated before he is willing to stop these dreadful plagues. SDA Bible Commentary Vol.4, page 843 (bottom right column second paragraph under “Dried up.”) The Commentary suggests as a corollary reading Great Controversy pages 654 to 656. But, page 635 and onward seems more applicable. other things are represented as well such as “Protestantism” and “Republicanism,” but the primary thing, to my way of thinking is the separation of church and state. If that goes away, so does all the other freedoms we enjoy! Remember, in our study of Revelation 13, I call the beast of verses 1-10 the “sea beast” because he came up from the sea; the beast of Revelation 13:11 is the “earth beast” because that is where he came from. but, don’t expect Satan to use those names! He is too smart for that. His name for “Wormwood” will be “Jesus of Nazareth.” Perhaps the name he uses for “Abaddon” will be some kind of macho name like Darth Varder???? of course, no “mocker” will be resurrected at that time! note that the pronoun “them” must refer to the “whole world” in verse 14. Ibid (under “Place.”) Note that I have paraphrased this wording somewhat. Naturally, those who hold to the historic application of the seven trumpets, will not give this explanation much, if any credence and will tend to favor the single “place” application. Be-that-as-it-may, remember that the seventh trumpet (or “third woe” Rev.11:14) is composed of all seven of the seven last plagues. Note that through all of the previous 6 plagues, the true God in heaven is not recognized until the very last one when God the Father announces “it is done.” Then, in verse 18, Jesus arrives planet earth on the great “white cloud” depicted in Revelation 14:14. Great Controversy page 433 reads: “’The temple of God was opened in Heaven, and there was seen in his temple the ark of his testament.”[REV. 11:19.] The ark of God’s testament is in the holy of holies, the second apartment of the sanctuary. In the ministration of the earthly tabernacle, which served ‘unto the example and shadow of heavenly things,’ this apartment was opened only upon the great day of atonement, for the cleansing of the sanctuary. Therefore the announcement that the temple of God was opened in Heaven, and the ark of his testament was seen, points to the opening of the most holy place of the heavenly sanctuary, in 1844, as Christ entered there to perform the closing work of the atonement.” (note the omission of the last half of verse 19) Therefore, in this statement, Mrs. White ignores the context in order to point out the reality of what happened in 1844, something a prophet is fully qualified to do. Manuscript Releases Vol.20, page 221; see also Battle Creek Letters page 57. These statements make it clear (at least to my mind) that Mrs. White understood that the “third woe” or “seventh angel” of Revelation 11:14-19 is parallel to the seven last plague scenario of Revelation 15 and 16.